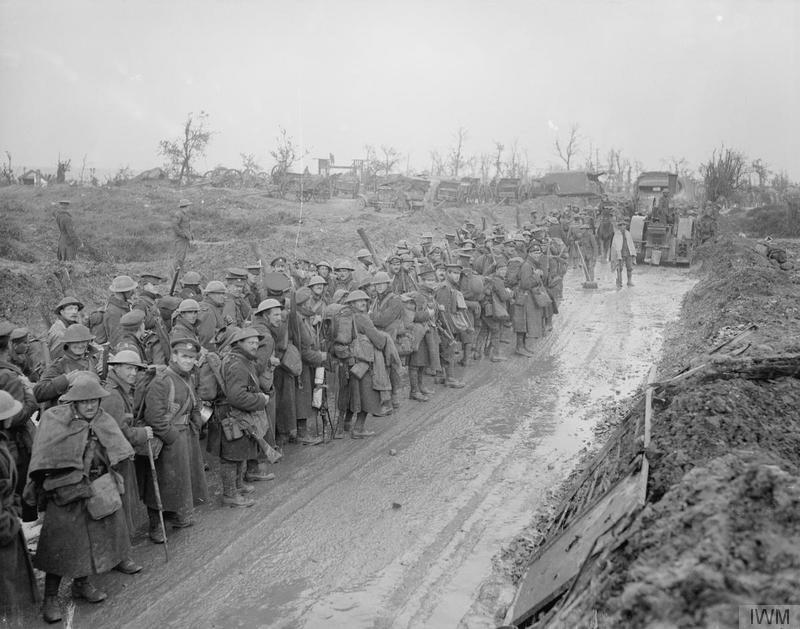 Troops of the 2nd Battalion, South Wales Borderers wait in the rain on their way to the front-line trenches near Montauban in October 1916. It’s a picture that’s worth 1,000 words. The men are laden down with kit: greatcoats, blankets, ammunition. They lean forward to counteract the weight of equipment. The hems of their coats are splattered with mud. Most of them do not smile at the camera. Even those that do seem to have a certain wariness in their expressions. Off to the right, at the top of a road, one man carries a brush, as if he’s sweeping mud off the wet road. Behind him is a tractor or traction engine and, beyond that, a muddle of motorised and horse-drawn transport. Off to the left, amid what could be shell-holes, are two casual observers, one in a cap and greatcoat, one in a tunic and helmet. Judging by their lack of equipment and laid-back demeanour, they’re not part of the column and aren’t about to head up to the front line. Perhaps they, like the sweeper and the tractor driver, are tasked with working on the road or are related to the trucks and wagons in the distance. This entry was posted in Events and tagged 1914-1918, Centenary of the First World War, First World War, First World War Centenary, Montauban, news, photography, Somme, South Wales Borderers, trenches, UK News, WW1. Bookmark the permalink.